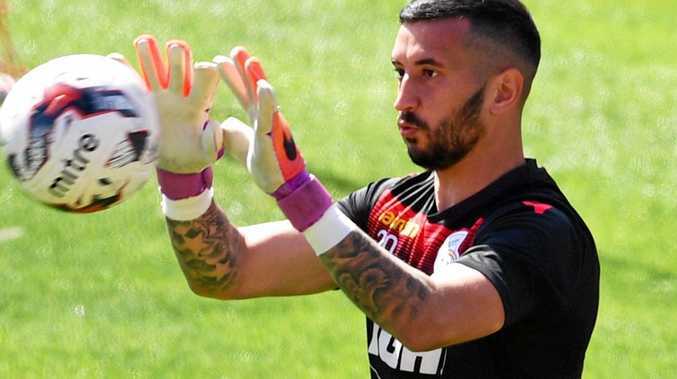 ADELAIDE United goalkeeper Paul Izzo says the club's mounting injury list is testing the squad's depth. The Reds entertain the unbeaten Newcastle Jets at Cooper Stadium tonight without defenders Taylor Regan and Ersan Gulum, and star forward Johan Absalonsen. After a decent start to the A-League campaign, Adelaide have lost their past two games against Melbourne City and Perth Glory. They go up against an in-form Jets outfit, with the league's top scorer Roy O'Donovan likely to test the home defence even further. "It's obvious we're not blessed with the deepest squad,” Izzo said. "Hopefully if we get a few boys back, it will make a massive difference. Izzo said he and his teammates' dip in form was only temporary and was hoping a win tonight would get the season back on track. "We can say we didn't play too well this past week and the week before, but at the end of the day we still leave the games with confidence,” he said. "We're doing some very good things and the season's very long and it's very early into it. Newcastle are flying under Ernie Merrick with three wins and two draws from the opening five weeks of the campaign to sit in third place on the ladder. It has been the attacking exploits of the Jets that have been particularly impressive, and they showed that again last week when defeating Wellington Phoenix 3-0 at home. The Jets have won on both road trips this season.